The U.S. retail market is booming. E-commerce continues to exhibit double-digit annual growth in the multitrillion economy. Over the years, the uptake of the internet and customizable services through apps has brought unprecedented fortunes to Jeff Bezos and his cronies at Amazon. Indeed, digitally native brands can be considered as the future because unlike traditional brick-and-mortar stores, they offer that direct connection to the customer. Weirdly enough, millennials today don’t just want to buy a product just because it promises heaven and earth, they would like to know where the products are made, the companies’ environmental stance, and how the company contributes to/affects society. It’s a new age. 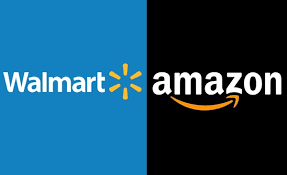 For a period, the Walmart Supply Chain had numerous issues that made the company unable to challenge with Amazon on the digital markets front. As Walmart’s e-commerce CEO, Marc Lore, recently shared in a media briefing, they have realized that when people shop both in online stores and in-stores, they tend to shop twice as much. Amazingly, Lore shared that once those who traditionally make in-store purchases check out their online platform, they are likely to make more in-store purchases in the future. It is documented that in 1994, Jeff Bezos, Amazon’s CEO came upon the interesting statistic that the Internet was growing at 2,300 percent annually. He then decided to go with the winds and factor that into his business plan. In doing so, he altered the conventional school of thought of what was really possible in the online space. However, before his idea really took off, Walmart was the dominant force in the commerce industry. The establishment would offer customers with the lowest possible prices to acquire goods and thereby leverage large-scale purchasing power because the cultural norms tend to compel people to implement cost-cutting measures. As a result, most small business owners and solopreneurs succumbed to great pressure from Walmart and went insolvent. Hence the term “Walmart Effect” came to be. Due to the great stridesAmazon has made over the years, there has been a role-reversal and the oft-used phrase is the “Amazon Effect”. While the top brands in the nation have been engrossed in a competitive battle, the consumer experience has relatively remained unchanged because of the plethora of shopping options available. For small-business owners, a change in tact is also necessary in order to overcome the “Amazon Effect”. Implementing strategies like listening to consumers, offering numerous services/products, and focusing on local selling strategies can help shield them from the threat posed by the uber-successful companies. There’s a lot of other important takeaways for entrepreneurs seeking to establish themselves as dominant forces in the market. Through continued innovation, and playing by a long-term vision, not temporal gains, did the great business establishments get to where they are today.